Panasonic Toyota Racing reaches the end of a successful season with a trip to the United Arab Emirates for the first-ever Abu Dhabi Grand Prix, held on the new Yas Marina Circuit. Not only is this weekend's race held at a new venue, it is also held in unique conditions with the race starting in daylight at 5pm local time but finishing in darkness and under floodlights 55 laps later. The track, which will become the 67th to hold a Formula 1 World Championship race, winds its way around Yas Marina through a series of 90° turns but also includes two long back straights where the cars are expected to reach over 300km/h. 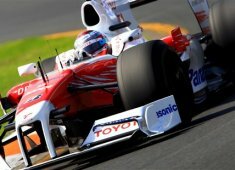 Toyota is looking to add to the 54.5 points it has scored already this season, having been unfortunate to miss out in the Brazilian Grand Prix when Jarno Trulli was involved in an accident while challenging for another podium finish. Kamui Kobayashi made an impressive Grand Prix debut in the same race and will again compete in Abu Dhabi in place of Timo Glock, who has a cracked vertebra. Jarno Trulli (Car 9): "It's been an up-and-down season for us with such a strong start followed by some disappointing races in Europe then a really competitive end to the year. As Abu Dhabi is a new track it's impossible to predict how we will perform but after the speed we showed in the last three races I am confident of finishing the year on a high. I was extremely frustrated to be eliminated by an accident in Brazil because we had looked very quick all weekend and I genuinely believe we had a fantastic chance of finishing on the podium. So I am confident for this weekend and I am really motivated to get another great result before the season ends. Abu Dhabi looks like another fantastic new venue and I am really interested to see what the track is like to drive so I can't wait for practice to begin on Friday." Kamui Kobayashi (Car 10): "I am really looking forward to my second Grand Prix and I want to make the most of this unexpected chance. I didn't know the track in Brazil and that was a little bit of a disadvantage because almost all the other drivers had some experience of it. But that's not the case in Abu Dhabi; this is a new track for everyone so that should help me. I am also more familiar with the car now, as well as other procedures during a race weekend like pit stops and the two tyre compounds, so I expect to be more competitive in Abu Dhabi. I am sure the car will be strong and I will do everything I can to try to score my first points in Formula 1. Of course it will be extremely difficult because the field is very strong and this is just my second Grand Prix but I will give my all." John Howett, President: "We are very much looking forward to the first Abu Dhabi Grand Prix, which marks the end of an eventful and positive season for us. Even if we haven't yet achieved all our targets, we produced a very competitive car and when we made the most of its potential we were able to fight systematically for the podium. Having discussed the medical advice with Timo and his management, the team has decided to take no risk and to put Kamui in the car. He proved in very difficult circumstances in Brazil that he can compete in Formula 1 and we are looking forward to another gutsy performance. This track is again new to him but that is true for everyone, which should work in Kamui's favour, so we are expecting a strong display from both drivers."